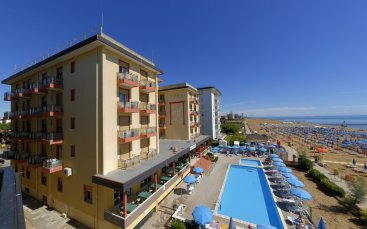 We propose the best last minute offers in Jesolo Lido to spend a vacation on the beach at a cheap and convenient price. You can choose the place and the type of accommodation based on the most economic offers, get in contact directly with the accomodation, and book your holiday at the lowest price without extra charges. Hotels near the beach and seafront, residences with pool, and apartments for rent located along the shore of seaside resorts are able to satisfy all your needs of wellness, quality, and saving. In this portal you will find usefull information about the events and displays that take place during the various periods of the year, what to see and what to do while on vacation by the sea, suggestions for theme-holidays with family, friends and pets without missing quality and comfort. In this website for low cost vacation, you can find the best last minute offers in Jesolo Lido and book right away your holiday by the beach, choosing between flats, hotels, and campings. To make your booking easier, you can contact directly the facility that satisfies your needs, without extra charges and booking easily your holiday in Lido di Jesolo. The well-known shore of Jesolo, about 15 km long, begins in Porto di Piave Vecchia and Porto di Cortellazzo and goes all the way to the area near the lighthouse, at the border with Cavallino-Treporti. It is known not only for the numerous accommodation facilities full of services and welcoming, but for the many events in Jesolo Lido that attract both young people and families with kids. You can make reservation in a hotel 2 stars, hotel 3 stars, hotel 4 stars, choosing according to the location, the category and the services included in the price. The various facilities in Jesolo offer quality services: air conditioning, sun-beds and -umbrella reservation on the beach, garage place or private parking, pool, free Wi-Fi connection, and much more. You can choose to reserve also an apartment for rent seafront or near the beach or a flat in residence with pool. Do not miss these incredible and cheap offers in Jesolo Lido at discounted and convenient prices: book now! iLastminute.com is a portal specialized in last minute holidays in Italy. It is a complete guide to choose between hotels, apartments, residences, touristic villages and campings at the most convenient price and to find discount offers. Choose the city and the type of accommodation, get in touch directly with the facilities and book your vacation without extra charges. Keep up-to-date with the best offers for Jesolo.